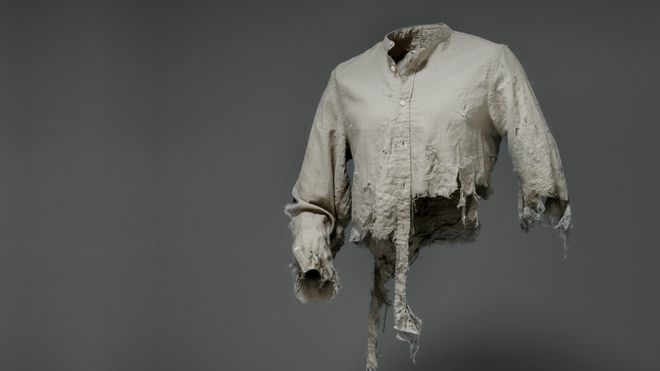 The Dutch rail infrastructure operator has defended its controversial “fashion line” featuring replicas of torn clothing worn by those killed and injured in railway accidents. ProRail launched “Victim Fashion” to encourage young people to be safer around railway lines. The campaign has faced backlash, with the Dutch infrastructure secretary saying it went too far. But ProRail told the BBC it was “necessary” amid rising fatalities. It says the number of people killed on and around railways has almost tripled since 2016, with 17 fatalities recorded last year. The “fashion line” features torn jackets, shirts, dresses and other items of clothing and is being promoted under the slogan “Victim Fashion, made by accident”. The pieces are accompanied online by descriptions of what happened to the person wearing them. An image of a scuffed trainer has a caption explaining that a 14-year-old was reaching out for a phone she dropped on the track when a train hit her. Now almost 15, she is still in a coma. An orange dress was worn by a 15-year-old girl who followed her friends across the track while the barriers were closed and didn’t see the train coming. What criticism has there been? Dutch infrastructure secretary Stientje van Veldhoven said the campaign was “unnecessarily severe”, while the head of Dutch rail operator NS Marjan Rintel said it was important but not the right approach. “I have expressed our surprise, displeasure and horror to the management of ProRail,” she said. One train driver wrote on social media that the campaign had brought back memories of collisions. “Wow, just wow. I’ve spent the past six months seeing a psychologist after my last collision and thought I was over it. Big mistake. Thanks very much,” the train driver wrote. People claiming to be survivors of accidents have also hit out at the campaign. What does Dutch rail say? ProRail spokesperson Jaap Eikelboom said the “confronting campaign” was working. He told the BBC that ProRail spent around a year planning the action and knew it was going to be divisive. “If you do a confronting campaign there are always people who find it negative and positive,” he said. “We think the campaign is working because people are discussing it. If we don’t confront people with these kinds of pictures it’s going to keep happening.”.